“It is something, at the age of 31, to be among the most discussed, most successful, most promising, most admired and most hated British artists.” So wrote the critic Charles Lewis Hind about the war artist CRW Nevinson (1889-1946) in 1920. A few years earlier in 1916, Nevinson had garnered critical acclaim for an explosive one-man exhibition at the Leicester Galleries, combining his experiences of serving in France with the cutting-edge aesthetics of Futurism. By the time Hind was writing his critique, however, Nevinson’s turbulent ties with other artists and exaggerated claims of his war experiences had made him enemies in both the US (where he worked after the war) and Britain. Despite, or perhaps because of, his conflicting reputation, Nevinson remains one of the most enduring war artists on the auction block today. Prices for his best war works have continued to rise, reaching a pinnacle last year when Sotheby’s established a new auction record for the artist. Troops Resting, an oil which had been included in the famous 1916 Leicester Galleries exhibition, sold for a premium-inclusive £473,000 in London one hundred years later. Just two weeks ago, Christie’s sold another 1916 work in pastel From an Office Window for £112,500 against a £20,000-30,000 guide. While much of the focus (and money) remains on this period, Nevinson’s post-war art draws interest too, especially works which retain his earlier Futurist style. A winter landscape from c.1919 was offered a day after the Christie’s sale on June 28 at Roseberys (23% buyer’s premium) in south London. 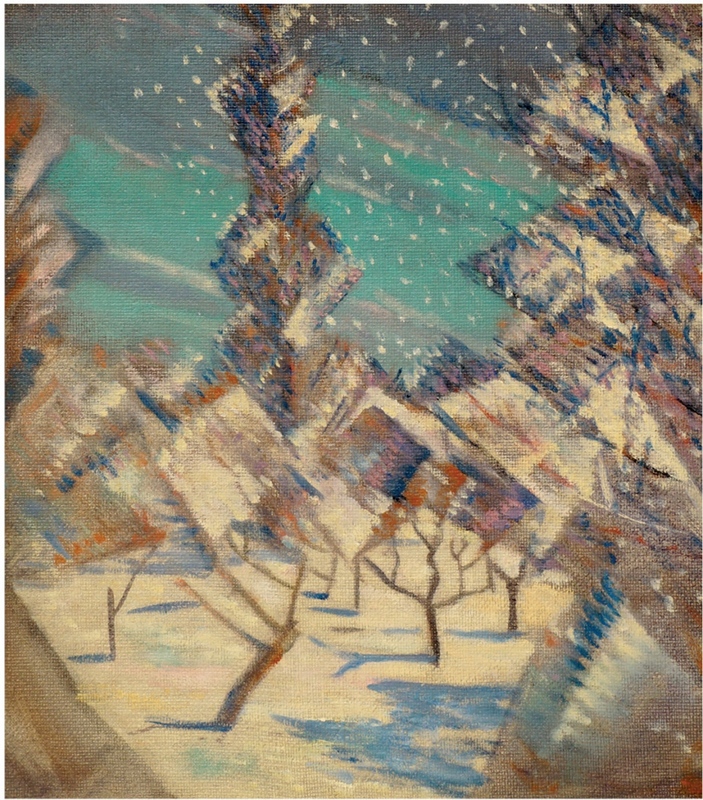 The 2ft 1in x 20in (61 x 51cm) oil on canvas came from Nevinson’s c.1919 series The Four Seasons, and depicted a bleak snowy scene with angular trees against a sky streaked with clouds. “The angular structure [of the trees] was synonymous with his work – he tends to do a lot of vertical structures across the composition,” said Vicki Wonfor, picture specialist and director at Roseberys. The auction house traced the work back to a Christie’s sale in November 1978, when it sold with the rest of the series at £3000. It had also been exhibited in 1980 at the Maclean Gallery in London. The other oils have cropped up only a few times since that 1978 sale, such as last June when Christie’s sold Autumn for a premium-inclusive £50,000. Roseberys’ £20,000-30,000 estimate on Winter reflected its less commercial prospects as a winter subject, and was secured towards the upper end by a private UK buyer bidding via thesaleroom.com at £27,000. “This was a nice piece but I think the subject was always going to be a slightly harder sell, because it’s so seasonal,” said Wonfor. Elsewhere in the Roseberys sale, more detective work was needed when five unsigned sculptures were consigned. Picture specialist Marcus Grey recognised the bronze forms as the work of Ralph Brown (1928-2013), a British sculptor from Leeds. Further research uncovered more detailed provenances and the group proceeded to sell for a combined total of £8600. 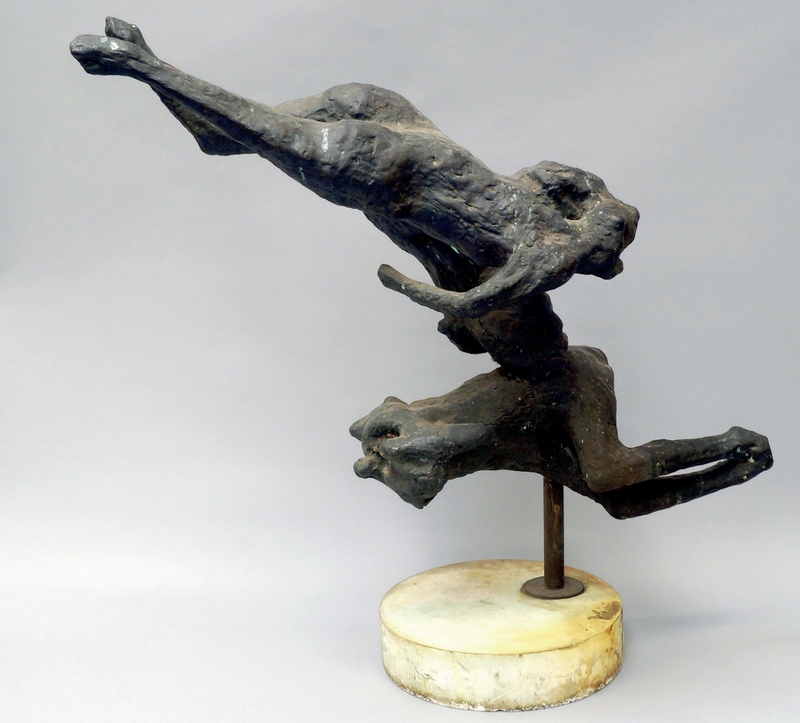 The top-seller at£3000 was Swimming, a 2ft 7in (80cm) high bronze from an edition of nine, possibly executed c.1960. Other casts from the edition are in the collection of the Art Gallery of New South Wales, Sydney, and Tate Britain. Elsewhere, a group of drawings by Thomas Hosmer Shepherd (1792-1864) from a private residence all got away above their guides to total £12,290. Shepherd was a topographical watercolour artist well known for his architectural paintings. The most sought-after of the 12-lot group was a 9½ x 21in (24 x 53cm) watercolour of The Great Exhibition in Hyde Park, c.1851. It sold for £1350 against a £600-800 estimate. The perennial allure of Venice held the key to two further successes in the sale. John Bratby’s (1928-92) vibrant Venetian canal scene, viewed through a window, bettered its £1500-2500 guide to sell at £6000. The 4ft x 2ft 4in (1.21m x 71cm) oil on canvas had come from a private source in Salisbury. 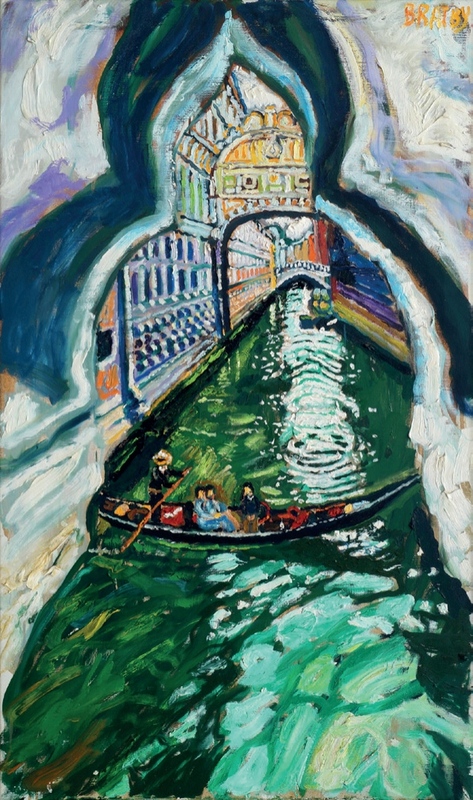 It was offered six months after another Venetian canal scene by Bratby sold at Sotheby’s David Bowie sale in November for a premium-inclusive £30,000 against a £4000-6000 guide. The other scene was of the Palazzo Ducale (the Doge’s Palace) by the Czech artist Antonietta Brandeis (1848-1926). It had an old label for MacConnal-Mason and sold to a gallery in Austria on top estimate at £7000.